The Bessie May Miss Marple Wrap is a classic chunky design, with slip through pocket for a secure cosy cross over to front. Decorative gathering square grid colour work patterning, with ribbed sections, adding texture, spring and style. Cute pompom detailing to finish it off perfectly. 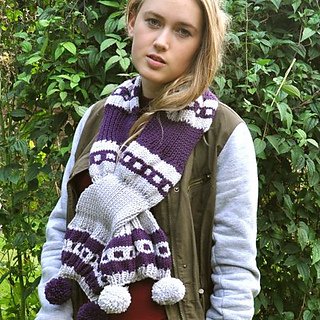 Intermediate pattern, with tube sections (knitted in the round), incorporating stripe and slip stitch colour work. Straight rib sections. Increase and decrease detailing between tube and straight sections. Great for growing knitting in the round skills as detailed instructions on setting up tubes for knitting in the round and joining them.